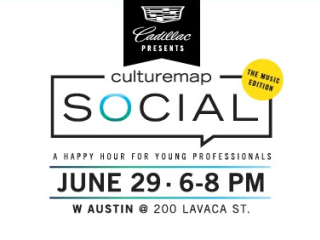 CultureMap is proud to present the second CultureMap Social this year, a quarterly happy hour series that fuses fun and philanthropy. With summer right around the corner, we've got fun, sun and music on the mind. The Music Edition will spotlight Austin Music Foundation, Austin Music People, Black Fret, Kids in a New Groove and Dub Academy. Attendees will be able to vote onsite at the event to decide which of these groups will win a $5,000 advertising package from CultureMap. The evening will include summer-inspired bites from from TRACE, fun in Smilebooth's Recording Studio presented by Cadillac, live music by Keeper and tunes from DJ BoomBaptist. Sip on cocktails courtesy of Tito's Vodka in addition to beer and bubbles. You'll also be able to get a new look from the beGlammed beauty and score some must-have swag from beGlammed, Criquet Shirts, Fine & Folded, Kendra Scott and Lounge County. Please note that you must be 21 or older to attend.